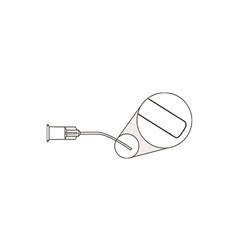 The AccuSurgical disposable Sub Tenon Anesthesia Cannula has either a curved or angled shaft with various tip types. Available in 19 or 21 gauge and 22mm to 25mm in overall length. Sold 10 per box. 19 gauge, curved shaft, flattened tip. Overall length: 25mm. 19 gauge, angled shaft, 7mm from bend to tip, blunt tip, tri port. Overall length: 25mm. 19 gauge, curved shaft, open tip. Overall length: 22mm. 19 gauge, curved shaft, blunt tip, tri port. Overall length: 25mm. 21 gauge, curved shaft, blunt tip, tri port. Overall length: 22mm. 21 gauge, angled shaft, 7mm from bend to tip, blunt tip, tri port. Overall length: 22mm.